Getting the Netherlands Architecture Institute (NAi) in place was a tough proposition indeed. After a veritable inter-city war, Rotterdam was selected as the venue for a joint venture between three Amsterdam bodies: the Dutch Documentation Centre for Architecture, the Architecture Museum Foundation and Stichting Wonen. The actual construction proceeded just as laboriously, once Jo Coenen had emerged as the surprising victor of a 1988 limited competition involving six architects with Rem Koolhaas heavily tipped to win. 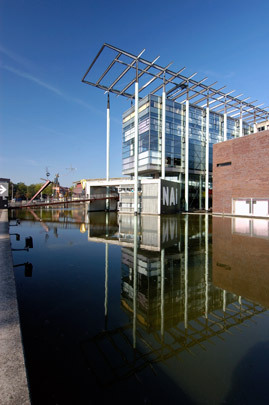 Coenen's design houses the institute's key functions - archives, exhibitions and staff - in three distinct volumes. Each volume has its own architectural character and relationship with the surroundings. The elongated archives building follows the curve of Rochussenstraat, screening off Museum Park from the rest of the city. It stands on concrete piers in a colonnade so that the park can be visually engaged through it. In the evening the colonnade plays host to Peter Struycken's spectacular light work. A café occupies one tip of the 'banana'. The exhibition block is a square concrete volume clad in brick. Besides the tall main exhibition space it contains two smaller rooms, a gallery and a Balcony Room. Exhibitions can also be held in the Upper or Attic Room between the six storey-high concrete joists; the floors there are of steel gratings through which daylight passes from the transparent roof down to the main exhibition space below. The tall central glass box contains offices and a library connected to the study areas in the archive block by a footbridge. The structure of this component consists of steel columns on the exterior of the envelope that meet above the glass box in a steel 'pergola'. The central entrance lobby and foyer are situated in the enclosed two-storey basement of this box, giving access to the glazed auditorium overlooking the ornamental lake. The entrance lobby was reached from the colonnade, and also from Museum Park over a slender wooden footbridge across the lake. The sculpture in the water is by Auke de Vries. In 2004 ‘The Hermitage’, a zinc and steel installation by Lebbeus Woods, was mounted on the north-east corner of the archives building. In 2011 the building was renovated by Jo Coenen & Co. and given a new entrance area with restaurant and Doedek for children. OMA designed the new permanent exhibition, de schatkamer (treasury).